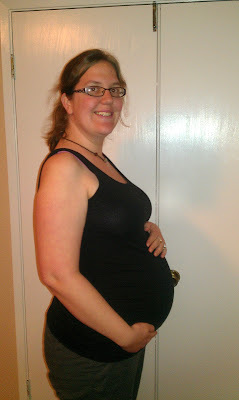 I think about things differently during this pregnancy with Oliver after having Alexander stillborn. Its too be expected. I know about everything that can go wrong. While I try not to dwell on it, there they are sitting in the back of my mind, all those what ifs. With Alexander's the worst that could happen in my mind was having to have a c-section, or possibly having him in the NICU with jaundice for a day r two. Yes it was in the very back of my mind that we may not get to take Alexander home, but I didn't know what that really meant. With Oliver I know what it means to not to get to take your baby home. And as morbid as it sounds I'm planning for it. Don't get me wrong I'm also planning to take Oliver home. I have two simultaneous plans going on in my mind. Plan A, the ideal plan of delivering a healthy baby boy, holding him in my arms and crying giant tears of joy because he is alive in my arms, of getting him home and not being able to believe it because I actually got to take him home. And then there is plan B, the contingency plan of delivering another baby boy, still and silent, because he joined his brother in heaven. I know what to do differently with another stillbirth. With Alexander I didn't know what to do, to take pictures, to hold him longer, to wrap him up in his blanket. I try to focus on plan A, taking a healthy Oliver home, but plan B is there and I can't seem to get rid of it. I hate that I have plan B in my head at all but it makes me think of and rejoice for the little things, things I didn't even think about before. I rejoice every time I feel Oliver squirm, kick, and flip because I know it means he's in there alive and safe. I rejoice that I don't feel him move quite as much as I felt Alexander because maybe his cord won't get abnormally long for him to get tangled in. I rejoiced when Oliver hit the 20 week mark because if he dies now he'll be considered a stillbirth and not a miscarriage, which means be issued a death certificate. He'll be in CA state record as having existed. It doesn't seem like something I should be thinking about but it is. And this week I anticipate Friday because it will make Oliver 24 week gestation which means if he is born prematurely they will actually try and save him instead of telling me there is nothing they can do. These little things give me hope. Anyone who has gone through a rainbow pregnancy can tell you that Hope is the most important thing. I praise God everyday for giving me two beautiful boys. One in heaven and one in my womb. I ask God every day to keep Oliver safe in my womb so I might meet his little self in Sept and to take all my fear and worry away. I wait patiently (and not so patiently sometimes) and prepare to meet my silly little boy. I cherish every moment I have to spend with him. I love every wiggle and hiccup. I keep track of his growth and development on my phone app. Oliver should be about a foot long and 1.25 lbs right now. His senses have developed to the point that he can hear whats going on around him. This morning he was dancing to the music at church. He also likes to dance to Celtic music (but who doesn't). I love my ever growing belly and even every stretch mark. I love this little dude with all my heart, more than I thought I could after his big brother went to heaven. But each new child only makes your heart grow. No wonder God has so much love to give. So while worry and fear crop up more with this pregnancy my plan is to love both of my sons and trust God no matter what happens. That way contingency plans aren't needed. I am looking forward to stretch marks, too! Never got any with Eve, but will welcome them if I get them this time around. I totally relate to what you write about here. Sadly, I feel like I can't make a happy healthy-baby-Plan-A yet, even though I'm 20 weeks in 2 days. We were *just* starting to get stuff ready for Eve when she died (at 31 weeks), so I guess that's why. Anyway, I'm glad that you can have a Plan A, even if you also have a Plan B going on simultaneously. How can we not? Hugs.